I see the #EatWell #TrainDirty hashtags on my twitter a lot (@ultraswimfast) and, while I sometimes struggle with one, I did a great job with both this week! I joined a HIT training group at my gym and am starting with 3 classes per week and building to 4 classes per week. I like the HIT training because it is very similar to the circuit training I did as a swimmer. It is fast, there isn’t a lot of rest, and so far it is easier on my joints than Crossfit despite having many of the same elements. My favorite homemade meal this week was an Alaskan Lox Carpaccio: Heirloom tomatoes, Lox, Arugula, garlic olive oil, red apple balsamic and some grated Parmesan. I made it for lunch several times this week. Everything was so fresh thanks to my CSA. 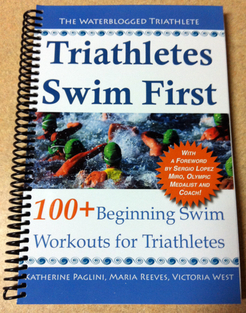 In other news, I’m excited to share that our e-book version of “Triathletes Swim First” has been hanging in the top #100 for both swimming and triathlon books on Amazon since we released it three weeks ago!!! The POD version is now available and the spiral bound version will be here in a few weeks. ‹ How to Make California Rolls! Just bought your book on Kindle. Look forward to incorporating your workouts into my training day! Thanks! I really hope you like it!! !